Read Yertle the Turtle by Dr. Seuss. Then, play Yeartle the Turtle Stacking Game! "In the story, greedy Yertle makes a stack of turtles for a throne, but in the end he stacks too many and they all come toppling down. Visit Education.com for instructions on how to make and play the game! 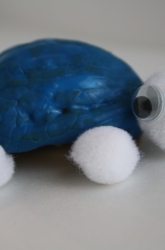 Click here to find out how to crack a walnut shell in half, for your turtle, without damaging it!